China's requirements on automobile EMC’s are becoming increasingly standard and strict. Major automobile manufacturers and testing agencies have been getting more and more understanding about car products. Now automobile electronic products are emerging one after another and the functions are easy to realize, but EMC problems often plague our R&D engineers. 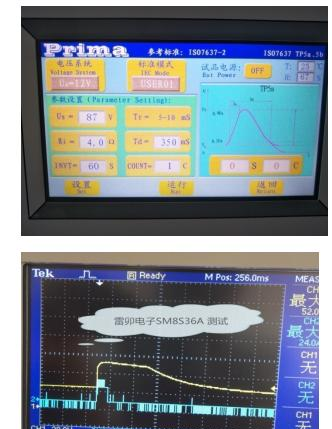 Lei Mao analyzed the EMC test items and key points of design demanded by typical on-board electronic products one by one; hopefully, it will help R&D engineers a little. Now many on-board products use smart bus terminals: intelligent information collection terminals with advanced Internet of Things and mobile internet technology. The following is a list of a manufacturer's vehicle-mounted information board card related to the communication interface. Question 1: With so many communication interfaces in the table above, which ones need to go throughstatic discharge testing? Answer: The whole machine first needs to go through the electrostatic discharge test. Any metal or non-metal interface that is accessible to the outside world needs to be tested for static electricity. Insulated electrical interfaces should go through an air discharge test instead of a direct contact test. The voltage level of general air discharge should be higher than that of contact discharge. Question 2: What is the electrostatic test level of vehicle electronic products? Answer: At present, the test level of the product is the contact discharge of ±15kV and air discharge of ±25kV. Question3:Which interfaces need to test ISO7637-2? Answer: Various requirements of ISO7637-2 include many waveforms such as P1A, P1B, P2, P3A, P3B, P4, P5A, and P5B. These are all to test the anti-disturbance degree of on-board products’ power ports against external power interference, so only the power ports need to be tested. Two plans are provided by CAN, as shown in the picture above. 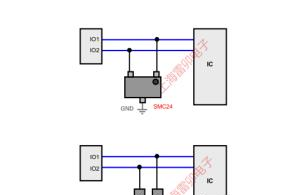 The integrated solution of SMC24 SOT-23 is adopted to protect cable CAN-H and cable CAN-L. 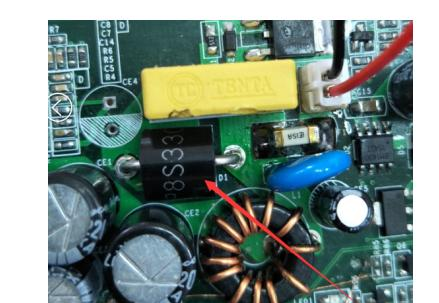 Under the agreement of RS232, it can be replaced by SMC12 SOT-23 or SD12C SOD-323. Alternatively, it can be designed as an integrated solution of SM712 SOT-23 under the agreement of RS485. The ULC0524P, ULC0544P10, and ULC0514P10 encapsulated with DFN2510 are adopted to meet the electrostatic protection requirements of HDMI1.4 HDMI2.0, as well as the standards for the eye diagram test. There are various types of 7637 test instruments, but it is very important to pay attention to the test results. Capture the waveform by setting the oscilloscope to the corresponding voltage and current.